Philadelphia Eagles quarterback Carson Wentz (11) throws in the pocket in the first quarter against the Dallas Cowboys at AT&T Stadium. It looked like the Eagles were going to hit the ground running against Dallas in a pivotal division game, but unfortunately, an outrageous ruling from the officials changed the complexion of the game. With the offense sputtering, the Eagles head into halftime trailing the Cowboys by a score of 6-0. Here's what I saw in the first half. Let's put it this way — if Carson Wentz doesn't get his act together, the Eagles' season is over. • It appears Doug Pederson finally got the memo from the fans about running the ball. The Eagles gave Josh Adams an opportunity to get going on Philadelphia's first possession, and the local kid made his head coach look wise. If only the Eagles could have sustained that energy for more than a single possession. Imagine how good they would have looked! • Not a bad time for Rasul Douglas to come up with his second interception of the season. Dallas looked to be picking up steam early in the second quarter, and then Dak Prescott tossed them an absolute gift, with Douglas breaking on the ball for a big-time turnover. Underthrow or not, you still have to come up with the play. And making that play will only fuel the part of the fanbase that wants to see Douglas get a chance at safety — with the Eagles sitting back in zone coverage, he was able to read the play perfectly and break on the ball. Douglas was probably Philadelphia's best individual player in the first half, full stop. Beyond the turnover, he had a couple nice tackles on the sideline to prevent big plays. • The defense got gashed by the run, but they ultimately held the Cowboys to six points in the first half. It may not have been pretty, but they held up their end of the bargain. • I'm not entirely sure how he does it, but Zach Ertz gets himself open on roughly 80 percent of Philadelphia's pass plays. It is remarkable. • Another week, another set of misthrows from Carson Wentz down the field. The Eagles are really missing a big-play element from this offense right now, and a lot of it comes down to the quarterback. He's getting the protection, guys are winning their matchups, and Wentz just isn't delivering. He just straight up hasn't been good enough this year, specifically on these plays. If the Eagles hit on even one of these miscues per game, we could be talking about a totally different season. Between the missed points, more time of possession, and rest for the defense, these plays are absolutely killing the Eagles. And most of these have not been a product of anything but his own poor throws. Pockets are clean, his legs are safe, he just needs to make the throws. The Eagles need him to outplay Dak Prescott by a decent margin, and he hasn't done it through 3/4 halves against Dallas this year. • Corey Clement getting hurt toward the end of the first quarter would usually find a home in The Ugly, but because of the way he suffered the injury, it's going here instead. You'll have to decide if you blame Jason Kelce's snap (this is where I lean) or Wentz's hands for the predicament, but Clement did his best to dig the Eagles out of that hole. He got swarmed by Dallas players and had his right knee bent back at an awkward angle. Don't want to speculate, but it certainly didn't look good. • Philadelphia's secondary struggling this year has been understandable. The top-end talent wasn't that good to begin with, and they've been banged up for the majority of the season. But the Eagles' run defense disappearing has been fairly inexplicable, and it's making their problematic defense even worse. Ezekiel Elliott is a talent, no doubt, but he was running untouched through the middle of Philadelphia's line. When you're not getting hands on a running back until he's into the second level, you've got big problems, and you have no chance to win the field position battle. The only thing stopping Elliott from ripping off a couple long touchdown runs was Corey Graham. He came up with a couple big tackles in the open field, but that doesn't exactly seem sustainable. • I truly thought we were past the point where a Josh Adams toss play was on the playsheet. Surprise, they added a new wrinkle, going to a toss option on third-and-one midway through the second quarter. Trying to run wide into the strength of Dallas' defense with a quarterback whose wheels haven't been there all season, I don't know how you can justify that play call. You're not even giving your guys a chance. • Wentz's protection has been plenty good enough to get it done. The fumble that came at the end of the first half was a product of his own poor awareness in the pocket because he had plenty of time to get rid of the ball before he put it on the turf. 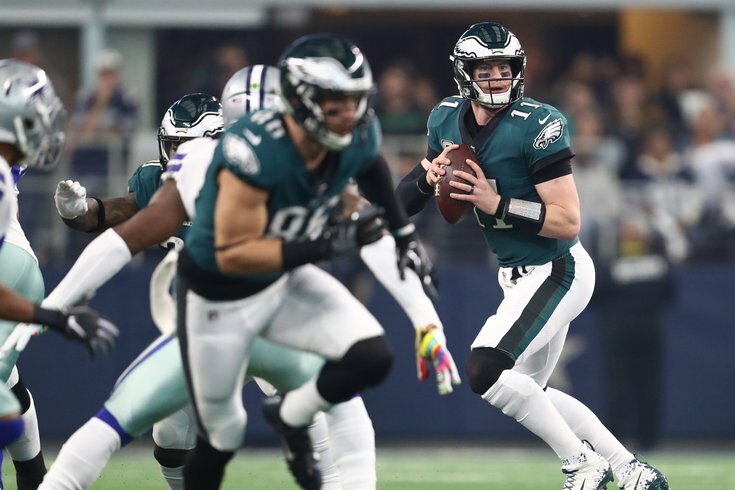 • The Eagles got off to what should have been the best possible start against Dallas on Sunday. Dallas fumbled the opening kickoff of the game, which was clear on replay, and Kamu Grugier-Hill backed up this past week's trash talk by scooping it up. But the officials, as usual, were too incompetent to notice it was a fumble in real time. So Doug Pederson was forced to use a challenge to try to get the ball, and it ended up failing because the officials claimed it wasn't clear who recovered the ball. There were three Eagles on top of the ball, and in any case if there wasn't a clear recovery in the first place, why would the officials allow the Eagles to challenge the recovery to begin with? We could argue about whether a guy running down the field with the ball in his hands is clear enough for this crew, but more importantly, they should have gotten the call right in the first place. The Eagles got punished twice over for their incompetence — they did not get the ball, and they lost a timeout and a challenge on the first play of the game. A complete joke, to say the least. At least the Eagles still forced a three-and-out, proving they were ready to go from the opening whistle. But when you have to play against the Cowboys and the officials, you're going to have a long day. • Sidney Jones was in the medical tent before the first quarter even ended. Starting to think his body might not hold up in the NFL.